Openherd: CINCO C'S ALPACAS is a farm located in Port Allegany, Pennsylvania owned by Christian & Carol Howard. Cinco C's Alpacas was established in 2002 as a new venture on the family farm. When Chris was growing up the Farm was home to a herd of registered Holsteins. Today it's home to our colorful herd of huacaya alpacas. You will find the alpacas grazing in a fertile valley of the Allegheny Mountains just outside of Port Allegany, PA. The alpacas and a small flock of laying hens are the only livestock on the farm now, but the 500+ acres has been continuously farmed and currently yields various produce that is sold in local markets throughout the area. We are extremely proud of our herd which is focused on quality colored huacayas. We constantly strive to improve the quality of our herd and to maintain diverse bloodlines. Every breeding and every addition to our herd is carefully considered with improvement in mind. Our champion and ribbon winning herdsires and solid foundation females are the basis for our successful breeding program. All of these decisions made it possible for us to earn the AOA Classc Cup at the 2015 Fleece Conference in Denver. This accomplishment is directly related to good decisions, patience and a little bit of luck. 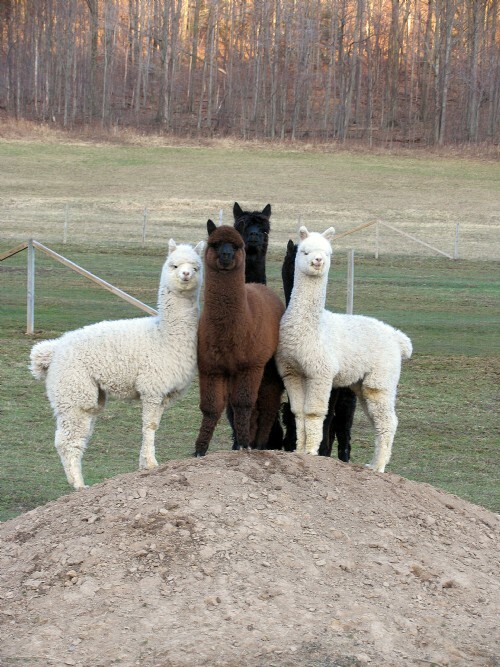 Our focus is on outstanding black and grey alpacas but we have many other colors as well. Be sure to check our listings to see our line-up of black and grey champions. Our services now include quarantine to Canada. If you have a need to export, please call asap to reserve space in one of these groups. We strongly believe in the future of the alpaca industry. Because of that we are active members of AOA, PAOBA, EAA, MAPACA and NEAOBA. In fact, Carol was a member of the PAOBA BOD for 8 years and retired after her second year serving as President. We also believe in education. Our constant desire for updated information is quenched by attending seminars and hosting them at our farm. From husbandry and nutrition to fiber and pasture management, we believe it's all important to the health and well-being of our alpacas. Check our calendar for workshops and seminars here at the farm. Come visit us and stroll the pastures, shop in the farm store, chose your next herdsire or foundation female or lets just talk about alpacas!!!! Whatever your alpaca desires, we will do our best to help you fulfill them. 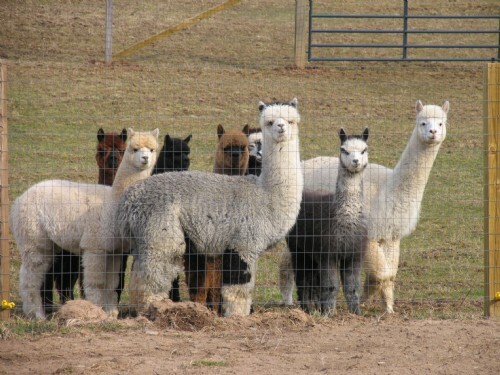 We welcome the opportunity to discuss your alpaca needs. Celebrating our 16th year of breeding alpacas! Whether you are just thinking about owning alpacas or looking for a great addition to your established herd come visit us. We offer champion herdsire services and males and females of many colors and ages for sale . If you don't see what you are looking for here, please call us. With over 100 alpacas there are alpacas who never get added to the site. We welcome your inquiries and encourage your visits.